We love Alienware's design, but this 17-incher doesn't deliver extreme performance that matches the price tag. 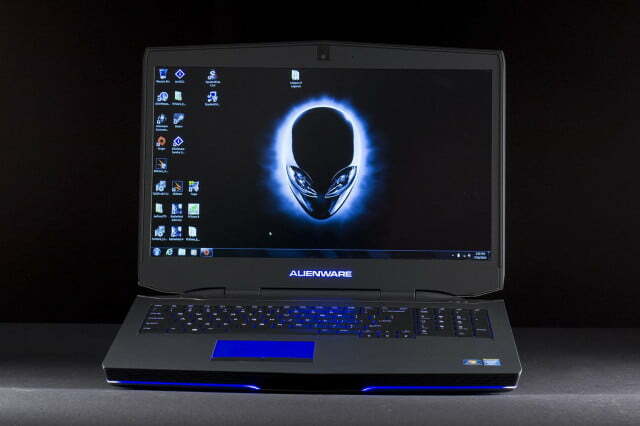 If you ask a gamer to recommend a brand of gaming laptop, there is a good chance they’ll say “Alienware.” The company’s acquisition by Dell in 2006 has attracted some detractors, but it remains a beloved brand, and for good reason. Size and corporate ownership offer many advantages to Alienware, not least of which is the opportunity to create a completely custom chassis for its systems. 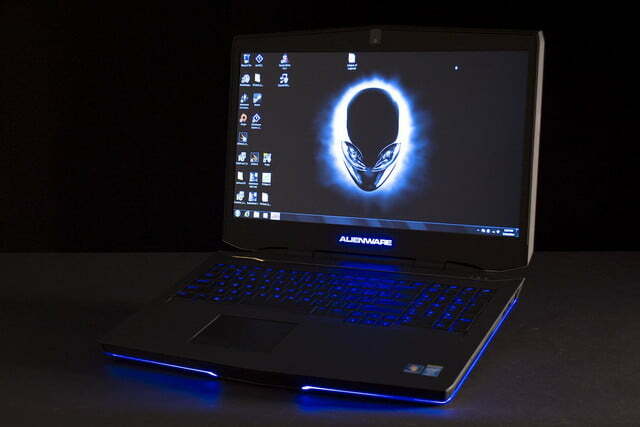 Though it’s the same size as earlier models, the Alienware 17 we’re looking at today is all new, and entirely unique. Only a few other major brands, like Asus and MSI, can share this claim. Smaller companies have to rely on barebones systems from big manufacturers in Asia. This Alienware has something else that, while not unique, is at least new to us; a Radeon M290X graphics chip. 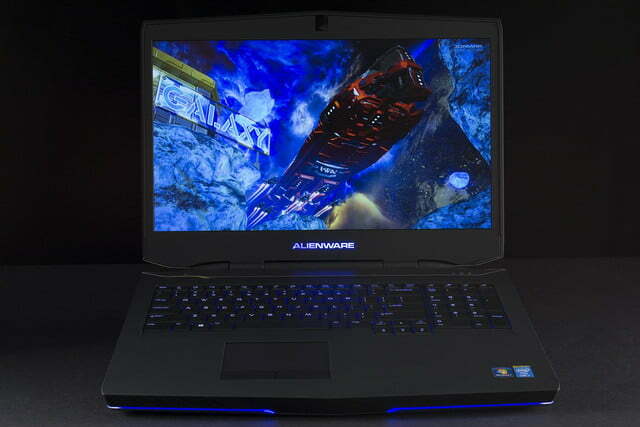 Nvidia’s GTX 880M has been the dominant presence in the high-end laptops we’ve recently reviewed. However, AMD’s alternative, which boasts 4GB of GDDR5 RAM, is no joke. Our review unit rings up at $2,598. That’s more than most gamers can afford, but it may be a good value if the M290X can prove its worth. 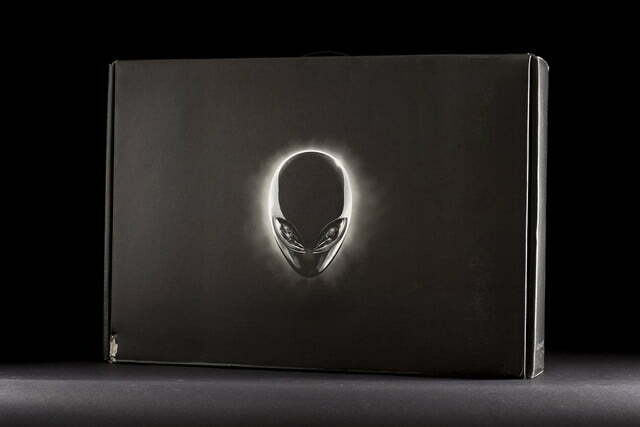 Is the marriage of Alienware and AMD a match made in heaven? 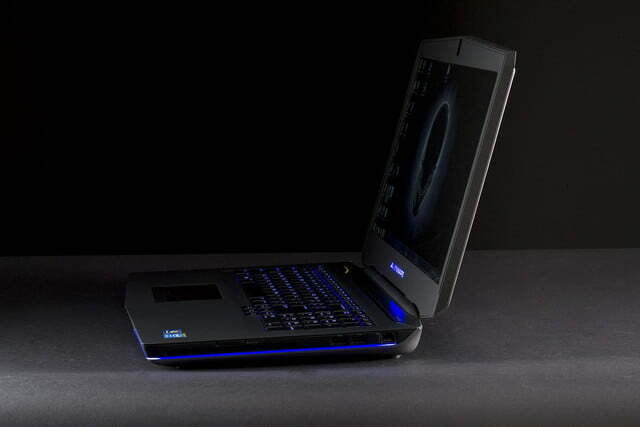 Most people, even gamers, would have difficulty telling the new Alienware 17 apart from its predecessor, the M17x. The company’s preference for simple, monolithic designs adorned with LED accents carries over to the new model, which comes in any color you’d like; as long as it’s black. Upon closer inspection though, the new version is a bit more detailed. The lid features new vent-like slats through which LEDs peek. 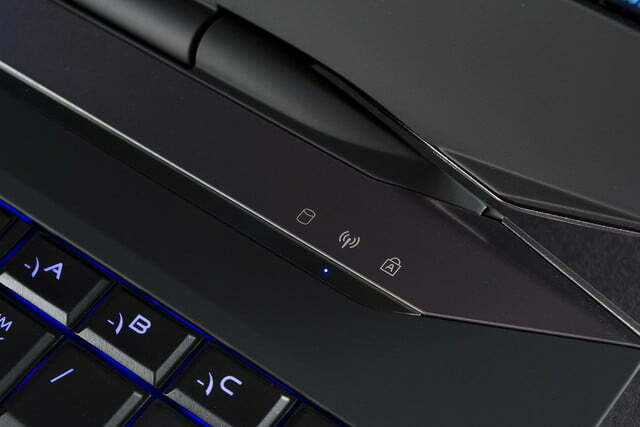 The forward edge of the laptop is no longer straight, but instead comes to a rather rounded point. 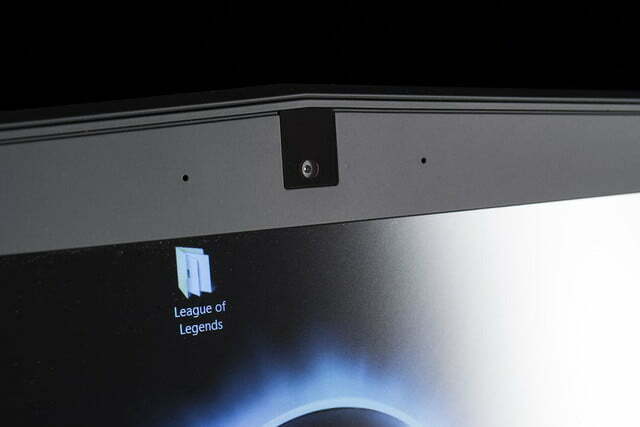 These small changes are enough to make the design feel fresh, but the overall look undeniably screams Alienware. The good first impressions the system earned through its aesthetics wear thin when the laptop is handled. 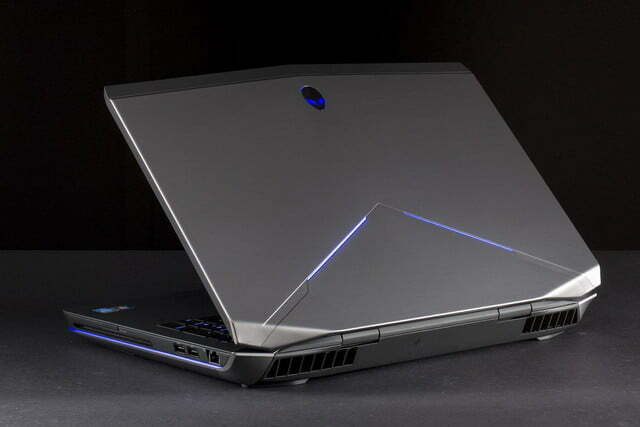 As is the case with most gaming laptops, plastic is the dominant material, and it has a hard time keeping the Alienware 17’s formidable bulk in check, despite reinforcements from aluminum and magnesium alloy. 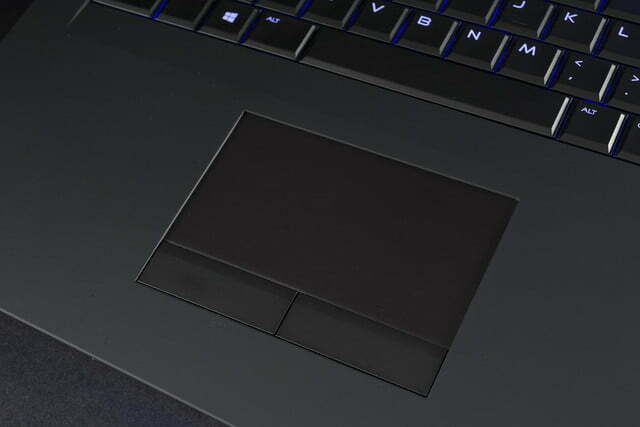 Picking up the laptop doesn’t reveal chassis flex, but individual panels deform significantly if pressure is applied in a weak spot (the center of the keyboard, for instance). We also noticed some flex when opening and closing the display. 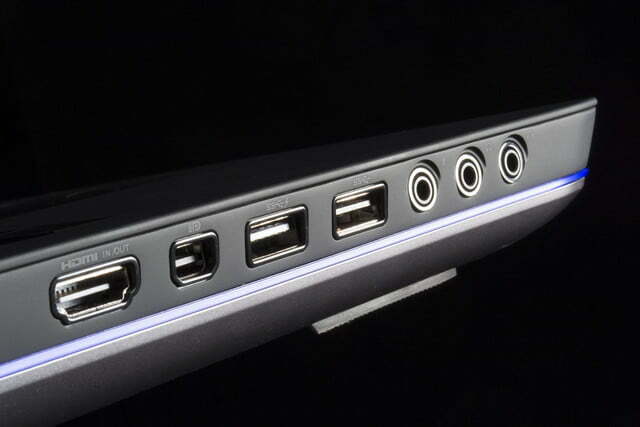 A plethora of connectivity options can be found on the Alienware 17’s meaty flanks, including four USB 3.0, HDMI, DisplayPort, Ethernet, and individual audio jacks for a microphone, speakers/headphones, and a gaming headset. 802.11ac Wi-Fi is supported here along with Bluetooth 4.0. Optical disc support comes via a slot-loading Blu-Ray drive. This is exactly what we like to see from a gaming system. The Alienware includes a large keyboard with a full-sized numpad. Neither the numpad keys nor the function keys are undersized, which makes both typing and gaming a pleasure. Everything is exactly where you’d expect it to be. Long key travel and reasonable tactile feel complement the great layout. There’s some flex to the keyboard, and typing quickly can feel spongy as a result. However, this did not have a tangible impact on our typing experience in the form of extra errors or missed keys. 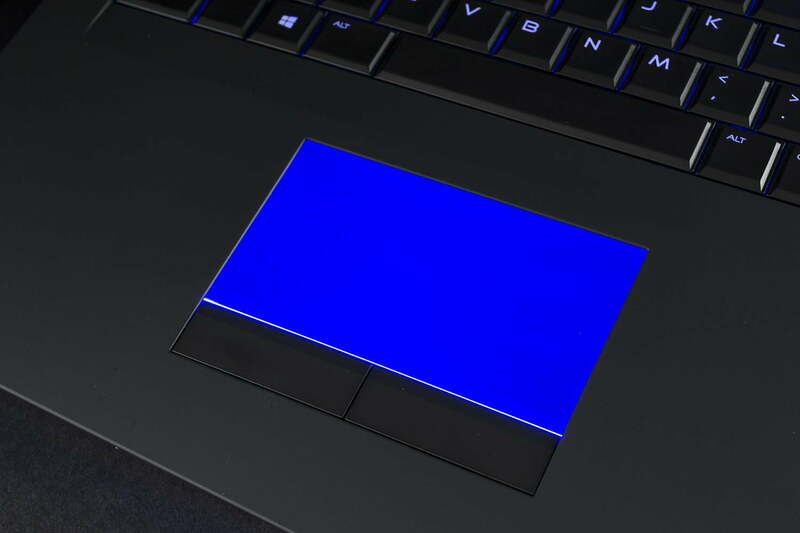 The keyboard’s multi-colored LED back-lights are controlled via an intuitive and speedy piece of proprietary software called AlienFX. A wide range of color and brightness options are available, and can be adjusted independently in four different zones. 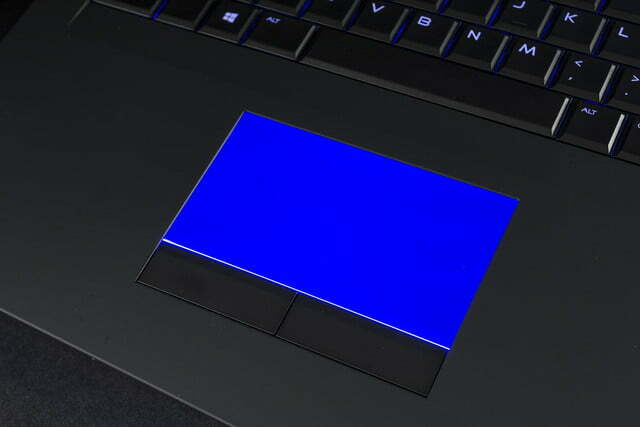 There’s almost no light leak from the keys, which makes this laptop perfect for use in a pitch-black room. A mouse is preferable for gaming, and most owners of this system will almost certainly use one. Even so, the touchpad can do the job in a pinch. Its surface, which measures four inches wide and two inches tall, isn’t large relative to the laptop’s girth, but provides enough room to get it done. Multi-touch gestures work well (when enabled) and the discrete, clicky left/right mouse buttons offer reasonable tactile feel. We weren’t surprised to discover that our review unit’s 1080p screen didn’t offer touch, but we were surprised to see a matte coating. 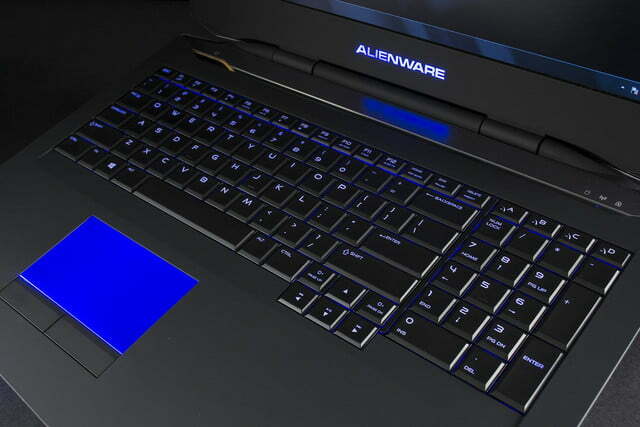 Every Alienware we can remember has had gloss, but this new 17-incher bucks the trend. Unfortunately, it may have been the wrong move. 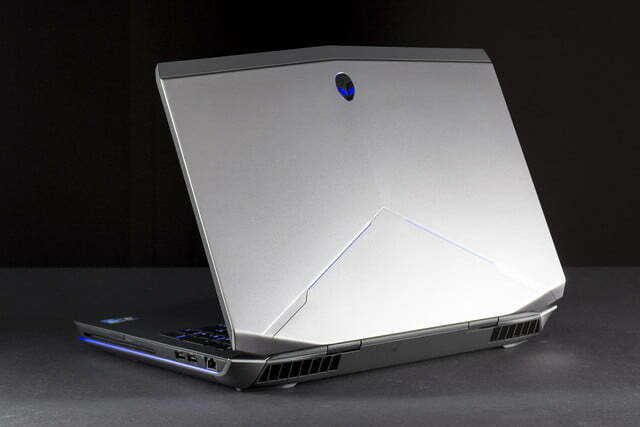 The new Alienware 17 is a powerful, well-built laptop that should fit the needs of most gamers well. Let’s start with the good news. The display can handle 96 percent of the sRGB gamut, which is much better than the AVADirect Clevo P157SM‘s 83 percent, and slightly better than the MSI GT60 Dominator Pro‘s 94 percent. 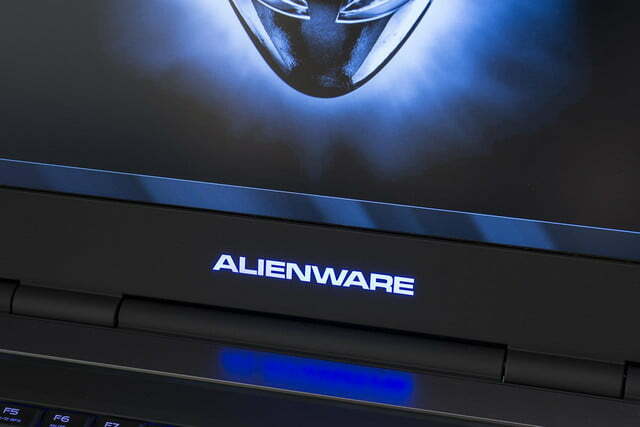 The Origin EON17-S ties the Alienware. We also recorded a maximum brightness of 284 lux, which beats the Origin EON17-S and the MSI GT60, though it falls behind the AVADirect’s maximum of 348. Still, this is a very bright display. It’s so bright, it’s even usable outdoors. Now for the bad news. The matte coat kills contrast. At maximum brightness, we recorded a ratio of just 520:1, which is the worst score we’ve seen in this area from a gaming laptop this year. Even the AVADirect managed a ratio of 560:1. We also noted poor color accuracy, particularly in gray scale. While the situation is not as bad as it is with the Origin EON17-S and the AVADirect, both of which have major problems with color, it’s still far from ideal. Though these problems don’t result in a terrible viewing experience, the technical faults are noticeable to discerning eyes. Even the most detailed content lacks depth, and warmth and actors sometimes have a slightly pale or sickly hue. The problems are most noticeable, unfortunately, in colorful games like League of Legends, which lacks the cartoon-ish pop you’d see when playing on a better display. At least the speakers are strong. They’re so loud that enjoying them at full volume is borderline painful, and bass introduces little distortion. In fact, they’re better than most inexpensive external speakers. Many users will see no reason to upgrade. 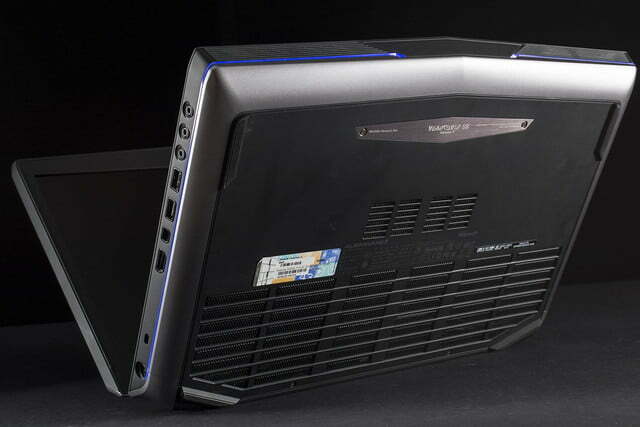 Our review system, like most configurations of the Alienware 17, arrived with an Intel Core i7-4710MQ processor. Though this is a quad-core CPU, it’s not the quickest that Intel makes by a long shot. So how did it hold up? As you can see, the Alienware 17 loses this competition, coming in behind all three competitors that we recently reviewed. However, the margin between the best and worst is pretty close. Therefore, this test score doesn’t do much to severely damage this notebook’s grade. The heavily multi-threaded 7-Zip benchmark, which simulates file compression performance, offers a similar conclusion. 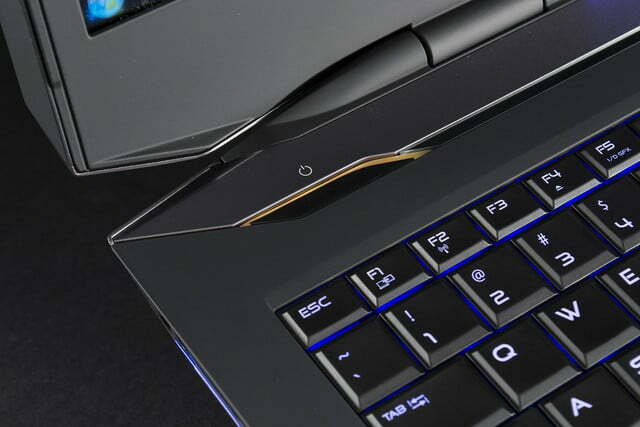 The Alienware 17 scored a strong 16,379, while the MSI GT60, AVADirect and Origin scored 18,695, 18,557 and 21,857, respectively. This still puts the Alienware behind the curve, though it’s no slouch. PCMark 8 achieved a strong storage score of 4,918 thanks to the system’s 256GB solid state drive. 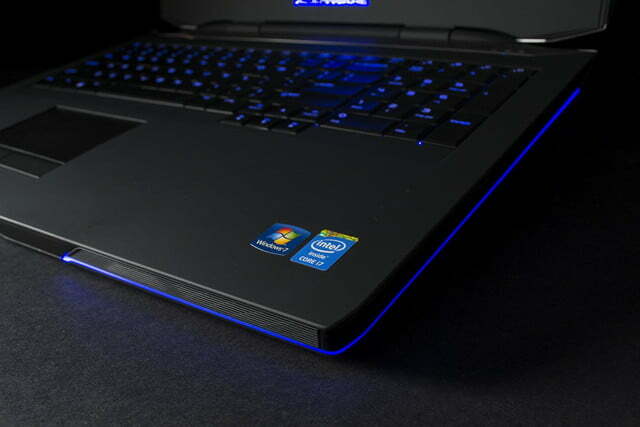 This is virtually on par with the MSI GT60’s score of 4,952 and the Origin EON17-S’ mark of 4,993. AVADirect’s Clevo P157SM-A scored a slightly lower 4,892. That said, these scores don’t represent a significant difference in real-world speed; all four are more or less equivalently quick. Next up is 3DMark, which is our synthetic gaming test. Will the 17’s Radeon M290X graphics card be able to match Nvidia’s GTX 880M? See for yourself. 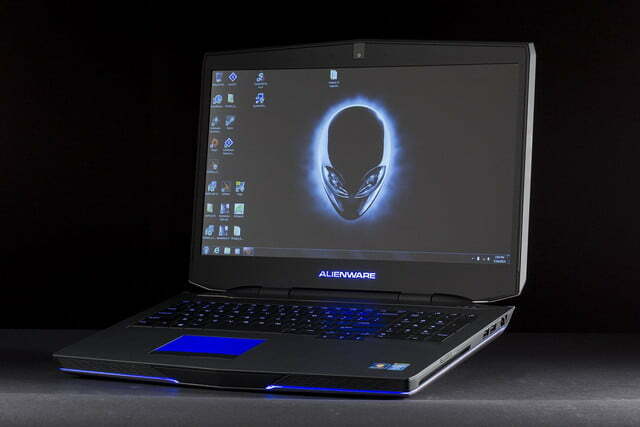 The Alienware 17 is well behind the competition here. 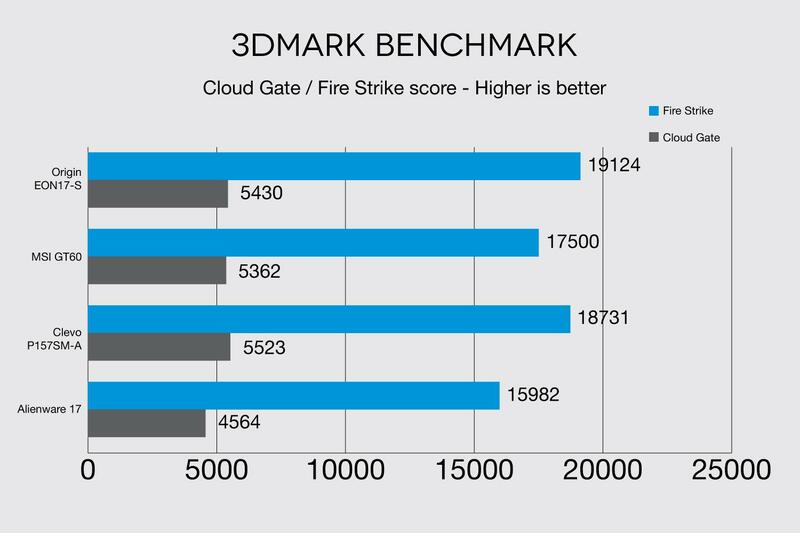 Its Fire Strike score of 4,564 is about 800 points less than the next slowest unit, MSI’s GT60 Dominator Pro, which scored 5,362. All three of the alternatives here are equipped with the GTX 880M, and all three defeat the Alienware’s Radeon M290X. It’s possible that the M290X will stack up better when tested in a realistic situation. To see what the system brings to the table when it comes to real world gaming, we booted up our usual suite of games, which includes Total War: Rome II, Battlefield 4, and League of Legends. All three games were played at the Alienware’s native resolution of 1080p. We started testing here by using the campaign map. At Medium detail, the Alienware 17 managed to hit 61 frames per second, with a maximum of 84 and a minimum of 47. Bumping up detail to Maximum decreased the framerate to 46 FPS, with a maximum of 59 and a minimum of 36. 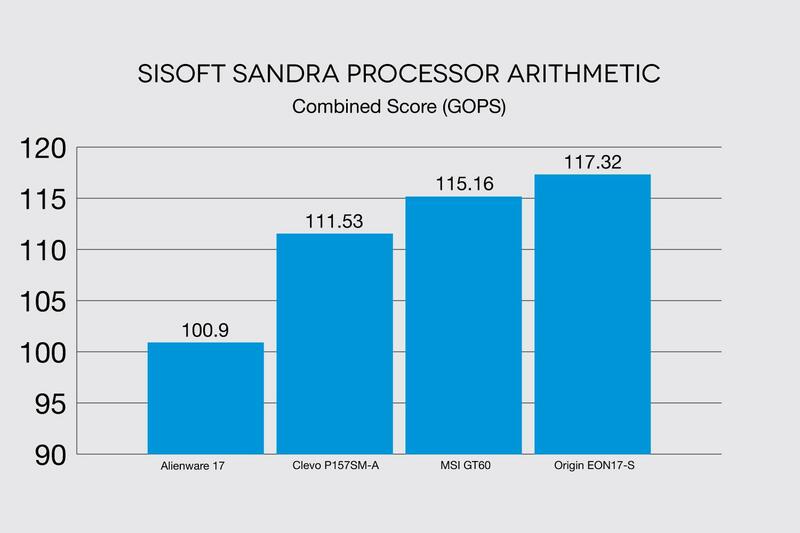 These numbers almost tie the AVADirect Clevo, which delivered 48 FPS at Maximum detail, but falls behind the Origin EON17-S, which reached 56 FPS. The difference is likely due to the processor, rather than the GPU, as this game is often CPU-bound, and the Origin we reviewed had an Intel Extreme Edition quad-core processor. DICE’s shooter delivered an underwhelming 65 FPS at Medium detail, with a maximum of 73 and a minimum of 60. At Ultra, the numbers dropped less than expected, coming in at an average of 44 FPS, with a maximum of 53 and a minimum of 35. These figures are respectable, but still behind the competition. AVADirect’s Clevo can hit 52 FPS at Ultra, while the Origin EON17-S reached 50 FPS at the same detail level. The gap generally isn’t apparent, but it can become noticeable during particularly intense gunfights. This can result in the slightly slower Alienware feeling less responsive. League of Legends ran like a dream on the Alienware 17. At Medium detail, the game hit an average of 171 FPS, with a maximum of 212 and a minimum of 126. At Very High, the game hit a smooth 133 FPS, with a maximum of 163 and a minimum of 109. These numbers beat the Nvidia-powered alternatives, as the AVADirect Clevo only hit 115 FPS at Very High, and the Origin EON17-S hit 126 FPS. The Alienware 17 is not an easy system to lug around. It won’t fit in many backpacks and, once crammed in, it adds just over nine pounds of bulk. The power adapter is large too, measuring in at eight inches long and four inches wide, though it’s only a bit more than an inch thick. Such short battery life can be blamed on power consumption. You’ll almost always need the adapter, as we found that the Peacekeeper Web browsing benchmark drains a full charge in just three hours and twenty-three minutes. That’s a bit less than the AVADirect Clevo P157SM-A, which managed three hours and forty-nine minutes, or the MSI GT 60 Dominator Pro, which lasted four hours. Only the Origin EON17-S, which can’t even reach the three-hour mark, performs worse, though it can use its more powerful processor as an excuse. Such short battery life can be blamed on power consumption. 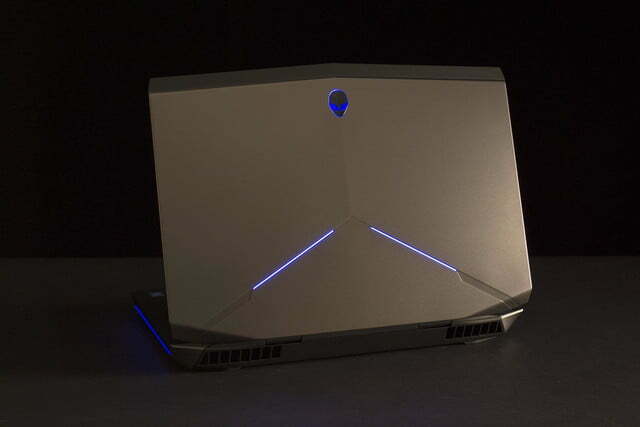 At idle, the Alienware 17 consumes 37 watts with the display set at 100 percent brightness. That’s 10 watts more than the MSI GT60, and seven more than the Origin EON17-S.
At idle, the Alienware 17’s cooling setup is surprisingly tame. The fan generates no more than 34.3 decibels of noise, and temperatures hang just south of 90 degrees Fahrenheit. These figures are on par with the AVADirect Clevo P157SM-A, and are much lower than the Origin EON17-S, which hits 103.3 degrees at idle. 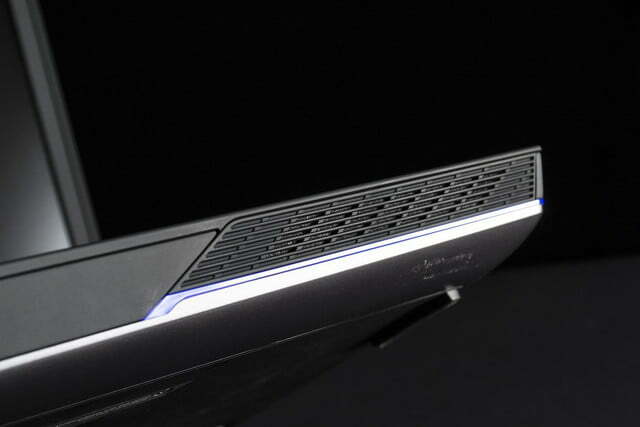 However, playing a game can get the Alienware’s fan to make as much as 50.9dB of buzz. That’s not unusually loud for a gaming laptop, as both the Origin and the MSI GT60 Dominator Pro make more noise, but it’s still loud enough to be a distraction. The fan at least does its job though, as external temperatures never exceed 91.5 degrees Fahrenheit. That’s the best load result we’ve seen from a gaming laptop this year. It’s worth noting that a large portion of this notebook’s underside serves as a vent. The new Alienware 17 is a powerful, well-built laptop that should fit the needs of most gamers well. While the Radeon M290X in our review unit provided slightly less capable graphics processing than the GTX 880M, it is also sold for less. You’ll have to spend about $250 more to receive a similar configuration with Nvidia’s hardware. That’s a price difference of about ten percent, which generally matches the performance gap between the M290X and the 880M. 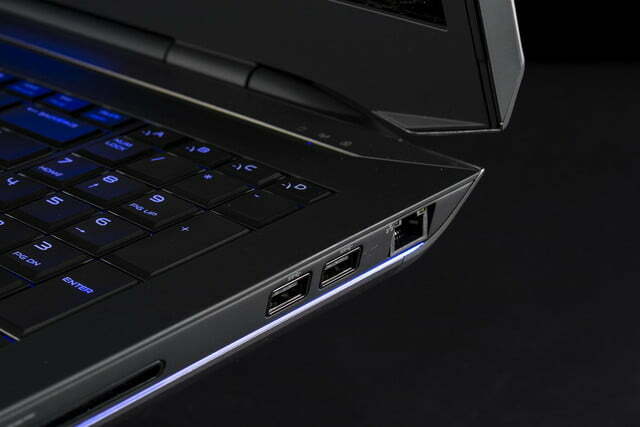 As usual though, Alienware’s hardware comes at a considerable price. MSI’s GT60 Dominator Pro and AVADirect’s Clevo P157SM-A both offer quicker hardware for less. Granted, they’re both 15-inch laptops, but the comparison doesn’t change much if they’re replaced with their 17-inch cousins (the larger MSI is actually less expensive because, unlike the GT60 we reviewed, it doesn’t have a 3K display). Past systems from this brand have justified their premium prices with slick designs and beautiful displays. With this new laptop however, the second half the equation has been lost. Alienware does offer a glossy display that might be closer to what we expect, but it’s only available in one configuration. Whatever the reason for such inflexible customization options, it’s indisputably bad for buyers. The lackluster display, combined with the Alienware 17’s inability to excel beyond the competition in other areas, make this notebook a tough sell. Any gamer who buys it will likely be happy, but other companies can provide as many smiles for less.